Last night in Geneva, 14 timepieces were honored at the annual Grand Prix de Horlogerie Geneva, which pays tribute to one watch in each of a dozen different categories. The final 14 winners were culled down from an initial 160+ watches that were submitted by brands in June. Additionally there was a Special Jury Prize awarded to The George Daniels Educational Trust. Here we bring you a look at the winning watches in each of the 14 watch categories. Chronométrie Ferdinand Berthoud for the Chronomètre Ferdinand Berthoud FB 1 manual-wind, patented 1,120-part mechanical chronometer movement that offers hours, minutes, seconds, tourbillon, fuse and chain and 53 hours of power reserve. Just 50 pieces are being built, each retailing for CHF 212,000. Piaget Limelight Gala Milanese Bracelet. With asymmetric sensually curved case lines, absence of lugs and supple Milanese mesh bracelet, this watch epitomizes femininity. CHF: 37,300. Cat’s Eye Tourbillon with Gold Bridge. A feminine re-interpretation of the brand’s famed “Gold Bridges” tourbillon movement, this manual-wind mechanical movement — the manually wound caliber GP09700-00012 – contains 174 meticulously finished parts and the gold case is set with diamonds. CHF 132,000. GRÖNEFELD 1941 Remontoire. Gronefeld’s 1941 Remontoire recalls the brand’s roots and houses a manual-wind movement that offers 36 hours of full, constant-force power reserve. CHF 54,880. Montblanc 1858 Chronograph Tachymeter Limited Edition. Housing a manual-wind mechanical movement with 50 hours of power reserve, this limited edition chronograph (100 pieces) pas tribute to the legendary Minerva chronographs. CHF 25,500. MB&F Legacy Machine Perpetual. An amazing re-interpretation of the perpetual calendar mechanism with a new patent-pending way to calculate the number of days in a month. CHF: 181,500. Girard-Perregaux La Esmeralda Tourbillon. This self-winding movement with 60 hours of power reserve and famed “Gold Bridges” was built in celebration of the brand’s 225th anniversary. CHF 194,000. Fabergé Visionnaire DTZ. An exceptional timepiece with an all-new concept for reading the second time zone, this self-winding watch was designed by Jean-Marc Wiederrecth and his team at Agenhor Manufacture and offers dual time zone indication. The watch features hours and minutes of the local time zone with peripheral, open-worked hands rotating around a raised decorated dome located at the center of the dial. The hour of the second time zone is viewed through an amplified aperture at the center of the dome. CHF 29,500. 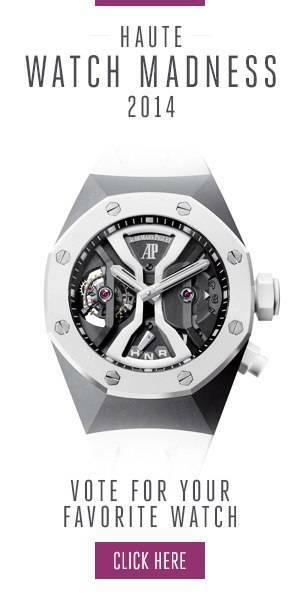 Audemars Piguet Royal Oak Concept Supersonnerie. Eight years in the making, the acoustic performance of this chiming watch is exceptional. The manual-wind mechanical movement also offers tourbillon, chronograph and striking functions. CHF: 561,600. Tudor Black Bay Bronze. This self-winding watch uses bronze and brown to make an individualistic statement. It offers hours, minutes, seconds and 70 hours of power reserve. CHF: 3,800. Eberhard & Co. Scafograf 300. Crafted in steel and housing a self-winding mechanical movement with date indication and 38 hours of power reserve, this dive watch is inspired by a 1950’s model and is water resistant to 300 meters. CHF: 2,640. Chanel Secret Watch Signature Grenat. Powered by a quartz movement, the singular beauty of this secret watch is its amazing gemstone setting. The one-of-a-kind cuff watch is set diamonds and orange sapphires and features a center carmine garnet weighing 52.61 carats. CHF: 759,000. Piaget Protocole XXL “Secrets & Lights” Venice Micro-Mosaic. An incredible work of art, this watch dial and case is made of individually hand-painted and assembled micro-mosaic tiles. It houses a manual-wind mechanical movement and pays tribute toe the Santa Maria Delia Salute basilica overlooking the Grand Canal. Just 3 pieces will be made. CHF 249,000. Tag Heuer Monza Chronograph. This self-winding mechanical watch recalls the brand’s involvement in the auto-racing world. It offers hours, minutes, seconds, date and chronograph functions as well as tachymeter and pulsometer. It is powered by the brand’s automatic Caliber 17. CHF 4,900. Czapek Genève 33 bis Quai des Bergues. The manual-wind mechanical watch owes its design to the 3430-pocket watch that dates back to 1850. The movement offers 7 days of power reserve and was made exclusively for the Czapek brand by Crhonode. It features a Grand Feu enamel dial. CHF: 23,980.